Glamour Girls of 1963 – Wonder Girls of 2013 | The International Cricket Hall of Fame. When it is a 50 year reunion you know they are not going to be spring chickens and you don’t expect too much from them. Just as they gave in their cricketing career they gave at this reunion held at the Bradman Museum & International Cricket Hall of Fame. Scotland, including Lorna Thomas the manager. memories they shared with volunteers and two of our present day young players, Ellyse Perry and Rachael Haines. Haines and Perry brought their recent trophies from the World Cup and the 20/20 Cup. I was amazed at how the 1963 team could identify from photos of 50 years ago. They showed us they could still handle a bat and ball and the fun and laughter was infectious. One of the ladies, Helen, made every player a patchwork placemat with all their names on it, what a lovely gesture and what a great keepsake for them all. Helen also presented a placemat to the Bradman Museum to share in their collection. they sang a special song for her. And Lorna didn’t let them down either as she bravely spoke of what a great team and friends they were. A 50 year reunion and these ladies are still friends it must almost be a record. company. I learned many things and feel I was their friend also. I often think as a volunteer you don’t give – you receive. This was a perfect example. I had a wonderful day and night. I came home thinking how lucky I was to have shared this occasion with them. I perfectly understood why they were dubbed the Glamour Girls of 63 when they toured England. 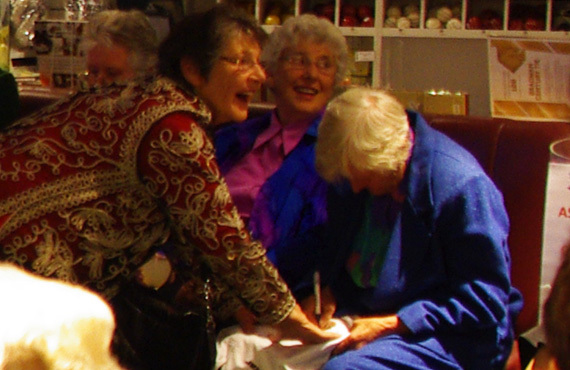 Today I thought of them as the Wonder Girls 50 years on!